What makes a narrative vast, according to the contributors to the recent MIT volume Third Person? Based on the varied content, spread across multiple media, covered by the book, vast narratives receive their designation not only due to the interior nature of the narrative, which may span unusual lengths when measured in years, amount of content produced, number of media in which the world is present, among other features (Harrigan and Wardrip-Fruin 2). 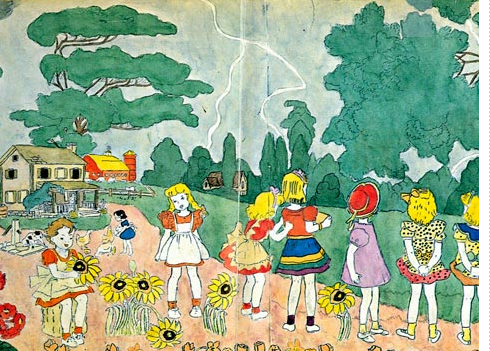 Henry Darger’s images of his Vivian Girls, trapped in an otherworldly battle for tens of thousands of pages written by Darger in virtual seclusion over the course of his adult life. Alternate reality games bridge the Lost world beyond the confines of the original television medium, endless clues and the constant suggestion of deeper meaning in the shows symbols, comic book-like world and story building with some characters reading comic books on the show allowing viewers a sense of interactivity with/in the narrative. Is a fantasy or sci-fi setting more easily adaptable to a vast narrative? Is it because of the pliability of the rules, so to speak, of physics, time, space and who can populate the narratives in these genres? Is it due to the relative rigidity of their Dorothy-like structure – Oz vs. Alice’s Wonderland (Bartle)? Is it some combination of the two? It seems a relative few who would be interested in (or possess requisite knowledge for) tracing the lineage of this system of narrative creation back to its origins: in D&D (with D&D in turn, able to trace its lineage back to the epic world-building and storytelling of the Tolkein universe, and so on). Yet just as narratives become more gamelike, games gain greater narrative structure, their worlds expand and they feel epic. Limited “setting” yields to immense “universe,” complete with history, culture, language and minutiae that might seem inconsequential to outsiders, but, to initiates, has great meaning. 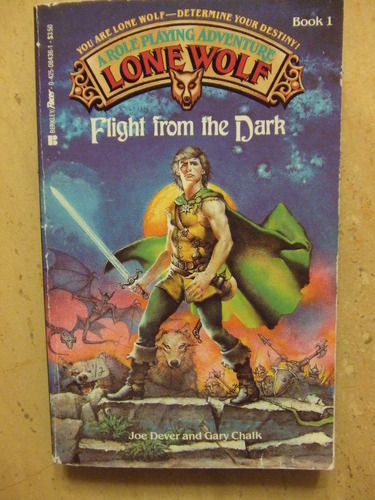 Book 1 of the popular “Lone Wolf” series of gamebooks, mid-1980s. The books featured an ongoing vast narrative comprising a universe, quests, mythology and a rule system for readers/players to follow and participate in, spanning many series and volumes. Players were encouraged to carry their character over from one book to the next. This book’s tagline is “You are Lone Wolf – Determine Your Destiny!” Other similar taglines included “The Hero Is You” and “Choose Your Own Adventure!” Although not all gamebooks provided vast narratives, those that did and gamebooks, in general, reached their zenith at this time, and this series is often considered the exemplar of the genre. It can now be read/played online at Project Aon (http://www.projectaon.org/). Indeed, as author Robin Laws points out, gamers love detail”(60). In the realm of vast narratives, viewers, readers and players converge into one: the fan. In fact, fandom is frequently a feature of contemporary vast narratives, perhaps due to the characteristic of such narratives to provide just the level of detail, and commitment, that these viewers/readers/gamers/fans love. One visit alone to Lostpedia or similar sites ought to be proof enough of this assertion. Fandom provides another appealing element to the follower of contemporary vast narratives: the ability to participate. Generating new entries in Lostpedia, playing along with an alternate reality game, embodying a character within a superhero game universe, or authoring a pen-and-paper RPG campaign all allow the fan to move from simple consumption to active participation/production within the confines of the narratives world. The desire to create original narratives can also drive fans of ones that already exist to build their own. 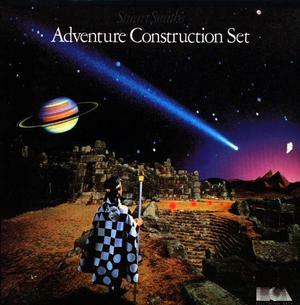 One mid-1980s computer title from Electronic Arts, the Adventure Construction Set, fulfilled this particular desire; in this case, the building of a new vast narrative, populated with quests, characters, classes, objectives, was, in and of itself, the game. Electronic Arts’ “Adventure Construction Set” (ca. mid-1980s) promised epic, immersive and endless worlds to be created and explored. The game player was a creator, and the gameplay consisted of the worldbuilding, rather than the actual play in the worlds themselves. An analogue today might be made to level builders who create new narratives and experiences within the context of established games, or the RPG aficionado who prefers to spend time developing campaigns rather than playing them. Will the “vast narrative” prove a useful unit of analysis for literature, media, games and culture studies scholars (among others)? Time will be the ultimate arbiter of the question, although it is undeniable that this term does begin to chip away at a genre-bending important but heretofore largely unstudied commonality that so many of these works share. Their sheer size, richness, detail, and the interactivity and commitment they engender are worthy of thought, particularly in an age when, on the one hand, we voluntarily immerse ourselves in the ongoing narratives of these works while simultaneously challenging ourselves to the restrictions imposed by Twitter and other short-blast media. Whatever the outcome of future study, an examination of the nature of the vast narrative will undoubtedly result in new connections being drawn across the boundaries of media and disciplines and will offer a better knowing of those of us whose labor and imaginations create them or who may simply be enticed to venture in to explore. Harrigan, Pat, and Noah Wardrip-Fruin. Third Person: Authoring and Exploring Vast Narratives. The MIT Press, 2009.